Toyota’s move to expand mass-production of fuel cell stacks and hydrogen tanks ten-fold post-2020 should banish any doubts what will power cars in the future. Toyota has big sales expansion plans for fuel cell, hydrogen fuelled cars, and other vehicles, such as buses within Japan and overseas. The company sees global sales of fuel cell electric vehicles (FCEV ) increasing significantly after 2020 to at least 30,000 per year from today’s 3,000. To prepare for this growth, the company unveiled plans for two major new facilities. The first is a new building near its original car plant for expanding fuel cell stack mass production, and a new line in an existing plant to manufacture high-pressure hydrogen tanks. The FC stack is what generates the on-board electricity from hydrogen and oxygen which propel FCEVs with zero emissions, and the tanks store the hydrogen fuel. Manufacturing both components at scale is critical to achieving lower system costs and wider availability for further growth and sales of FCEVs. To increase FC stack output, Toyota will move production from its current location, within one of the existing buildings at its Honsha Plant in Toyota City, to a new, eight-floor high-tech facility on the same premises, near the original site of the company’s first car factory in 1938. Toyota’s hydrogen tanks are made of extra-thick carbon fibre and are built to withstand major impacts. Construction of the new hydrogen tank line is starting now, while the exterior for the new stack production facility is already finished and work will now begin on the interior. Details of the respective facilities will be announced later with a view to start operations around 2020. As a technology, fuel cells are mature and ready to scale up. 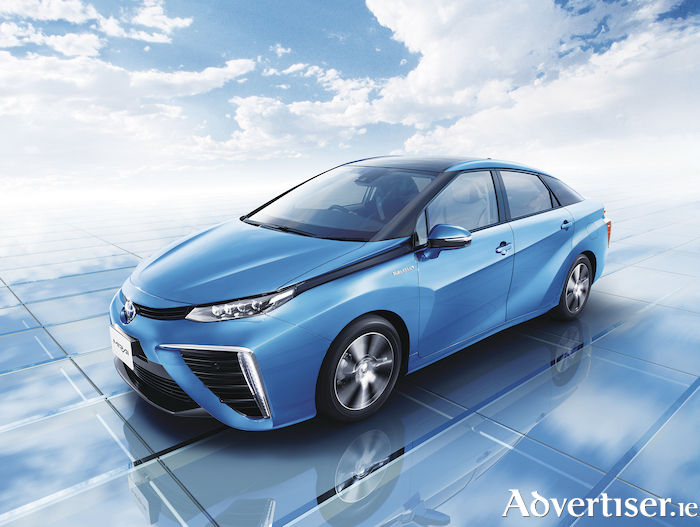 Toyota took the lead in bringing to market the mass-produced fuel cell sedan, the Mirai, in December 2014. Annual production and sales have increased yearly, going from about 700 units in 2015, to around 2,000 units in 2016, and, most recently, approximately 3,000 units in 2017. However, in order to encourage more widespread use of hydrogen-powered zero-emission vehicles, popularisation needs to start by the 2020s. Toyota aims for annual sales of FCEVs to top 30,000 units globally from around that time. At present, Mirai is sold in 11 countries: Japan, the United States, and nine countries in Europe. Toyota is working to develop an environment that will allow FCEVs to be sold in more countries and regions in the future. As part of this, demonstration tests of Mirai are currently under way in Australia, Canada, China, and the UAE, and Toyota is examining demand for FCEVs, while continuing to help with initiatives to promote hydrogen infrastructure development. On the commercial side, Toyota started sales of FC buses to the Tokyo Metropolitan Government in February 2017, and introduced the final version, the Sora, in 2018 with three additional units. Toyota aims to sell at least 100 such buses ahead of the Olympic and Paralympic Games Tokyo 2020. Going forward, Toyota will expand its FCEV product range and continue to strengthen product appeal, aiming to bring the cost down. Also, Toyota will keep working with Toyota Group and other companies to develop a hydrogen supply infrastructure and construct a low-carbon hydrogen supply chain. Through these and other initiatives, the company is actively contributing to the realisation of a hydrogen-based society.